The Black Panther isn’t Captain America. He’s not Iron Man, either. He’s different than most of Marvel’s big superhero characters and, in the right hands, he’s arguably better. Don’t think so? Read these comics and see. This post originally appeared in August, 2015. Fans got the first look at the movie version of Black Panther this week, via set photos that showed the Marvel superhero in action during filming. This week also saw the release of a Black Panther comics anthology that collects the 1990s run written by Christopher J. Priest. These comics have been on the Marvel Unlimited subscription service for a while but this latest collection gives curious readers who aren’t on the publisher’s all-you-can-eat backcatalog offering a chance to read them. That’s a great thing because the Priest Black Panther run is a work of underappreciated genius. The entire premise of Priest’s vision for the character is that lead character T’Challa—a technological genius who’s the king of a small but wealthy fictional nation called Wakanda—is perpetually misunderstood by nearly everyone. 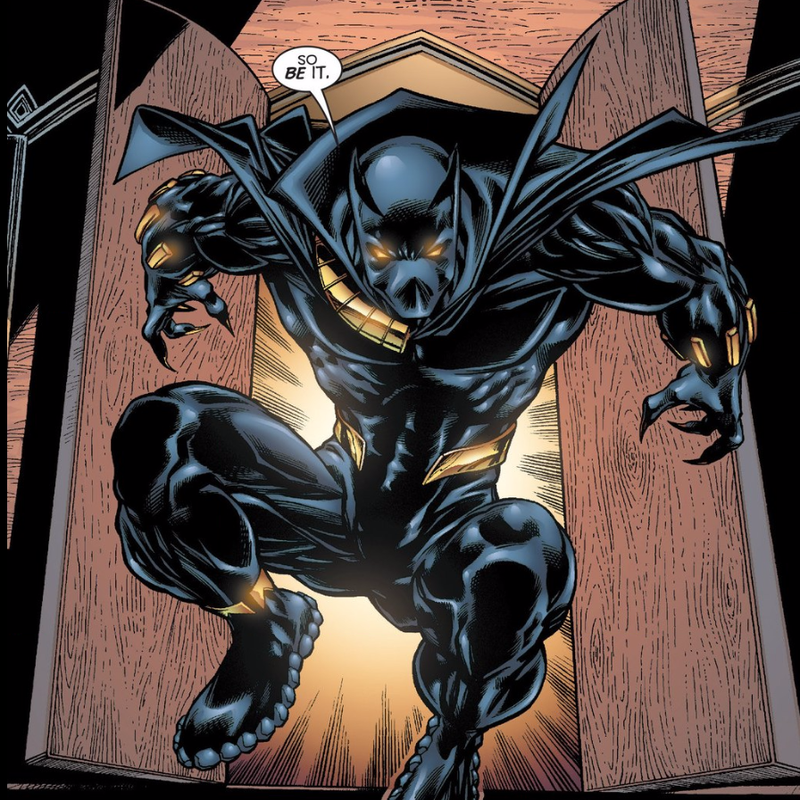 That misunderstanding, on the part of characters, readers and other creators alike, has traditionally led to the Panther being underestimated and under-used over the years. Priest—who was the first black person to hold an editorial position at Marvel back in the 1970s and 1980s—focused on the Panther’s role as sovereign leader of his people to craft story arcs that were superpowered political thrillers. But they were also romantic soap operas, joke-filled sitcoms and tragic character studies at the same time. Take the first story arc, The Client. The Client introduces Everett K. Ross as the viewpoint character, a stand-in for the reader encountering the Panther’s world for the first time. Told in a fast-forward-then-rewind, in media res style that bounces back and forth in time, the first few issues spool out a tale of a complex conspiracy to lure the Panther out of Wakanda so his enemies can engineer a coup d’etat and seize power. Along the way, the Avengers, Mephisto—Marvel’s answer to Satan—and then-president Bill Clinton all get involved. Parts of the Priest Panther tenure can seem dated, but not necessarily in a way that’s off-putting. It’s a DENSE run, with loads of text on almost every page. These comics are almost two decades old and the creative winds have shifted a bit but even when they were just coming out, they were a lot to take in. And it’s not just the word count either. Multiple subplots and a formidable, ever-changing cast of characters were also staples of the run, too. While it’s daunting at first, the rhythm of this particular approach quickly starts to feel normal. Priest’s Panther run is about principles and the forces in the world that assault them. T’Challa doesn’t want to rule his country through fear or intimidation and one of the subplots involves his adopted brother’s attempts to force ethical compromise onto his rule. His very presence in the United States helps an old rival create potentially dangerous political theater. The throngs of people on these pages are excited and volatile because they’ve not seen someone that looks like them getting treated with respect. But at the same time, they’re there because a politician is trying to flex his own muscle. It’s a deft, mature bit of writing that puts T’Challa’s status as a longtime Avenger to good use. There’s a charged thread of realpolitik running through all of this Black Panther run, recasting but not invalidating the Panther’s publishing history. While Wakanda was shown as hostile to outsiders before, Priest makes the country feel like a tense coalition of cranky factions that only really unites to hate on foreigners. And readers find out, for example, that T’Challa didn’t just join the Avengers for altruistic, la-di-da, let’s-all-save-the-world reasons. He did it to spy on them and see what threat these impossibly powerful people could pose to his realm. Wakanda’s wealth—which comes from being the sole source of near-indestructible metal Vibranium makes it a target. T’Challa’s duty is to protect it at all costs, which leaves him a very lonely genius king. His is a unique role in the Marvel Universe and these comics succeed by constantly reminding readers of that. It’s a great re-imagining of a character, mostly because its changes are rooted extrapolating out from the character’s foundational stories. The Client and subsequent story arcs also push back against the apathy and perceptions that accrued around T’Challa. You had to like or hate Priest’s take on this character. You couldn’t just ignore it. The Marvel Cinematic Universe is a very white place right now. Sure, there’s The Falcon, War Machine and maybe some others I’m forgetting about now but they’re not headliners. The inclusion of the Black Panther in a starring role is an important risky move for Marvel’s movie-making division. If we’re lucky, some of the best stuff from Priest’s run will wind up on the big screen when the Black Panther movie comes out in a few years.